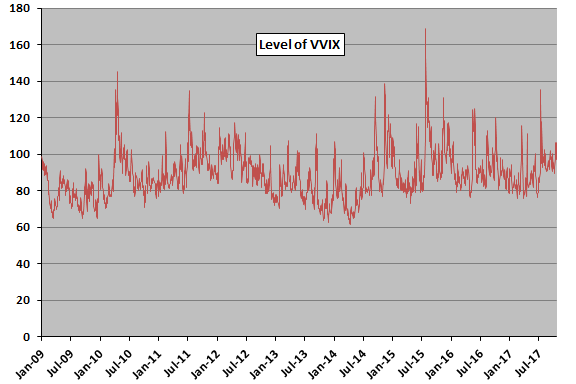 Level of VIX, in case a high (low) level indicates a future decrease (increase) in VIX that might affect VXX and XIV. Change in VIX (VIX “return”), in case there is some predictable reversion or momentum for VIX that might affect VXX and XIV. Implied volatility of VIX (VVIX), in case uncertainty in the expected level of VIX might affect VXX and XIV. Term structure of VIX futures (roll return) underlying VXX and XIV, as measured by the percentage difference in settlement price between the nearest and next nearest VIX futures, indicating a price headwind or tailwind for a fund manager continually rolling from one to the other. VIX roll return is usually negative (contango), but occasionally positive (backwardation). Volatility Risk Premium (VRP), estimated as the difference between VIX and the annualized standard deviation of daily S&P 500 Index returns over the past 21 trading days (multiplying by the square root of 250 to annualize), in case this difference between expectations and recent experience indicates the direction of future change in VIX. 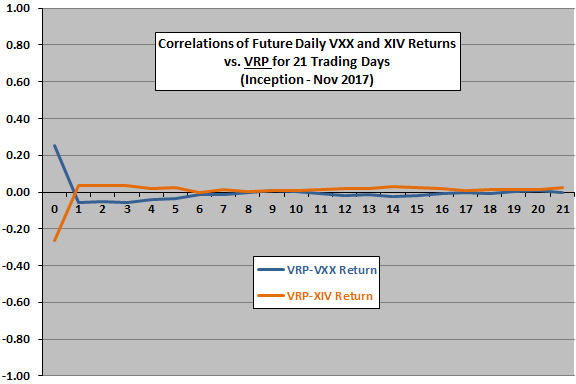 Correlations between daily VXX and XIV returns over the next 21 trading days to daily values of each indicator. Average next-day XIV returns by ranked tenth (decile) of daily values of each indicator. The following chart tracks daily level of VIX since the end of January 2009. We use this sample to investigate its power to predict daily VXX and XIV returns. 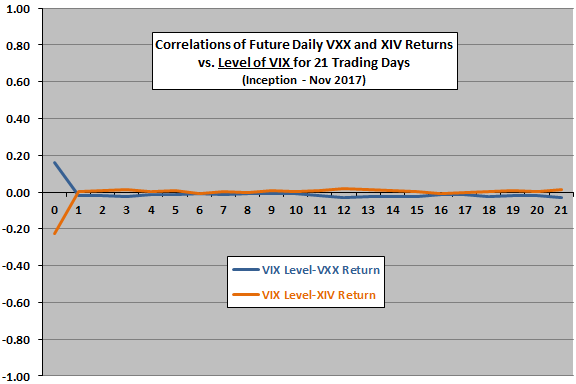 The next chart relates future daily VXX and XIV returns for each of the next 21 trading days to daily level of VIX over available sample periods. Day 0 is the VIX level measurement date. Results do not support belief that VIX level usefully predicts VXX or XIV daily returns over the next month. 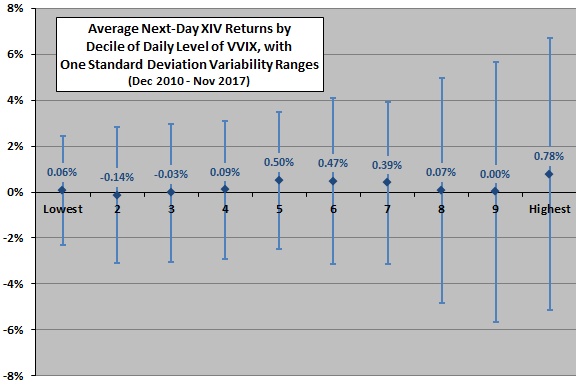 In case there is an important non-linear effect, we look at average next-day XIV returns by decile of daily VIX levels. 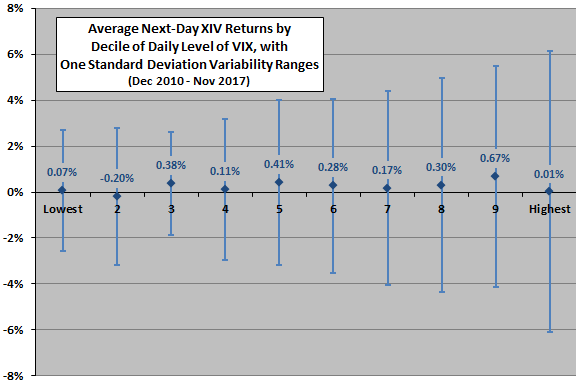 The next chart summarizes average next-day XIV returns by decile of daily level of VIX over the available sample period, with one standard deviation variability ranges. There is no progression of average returns across deciles, nor much temptation to develop a strategy that excludes returns for high or low levels of VIX. What about change in VIX level? 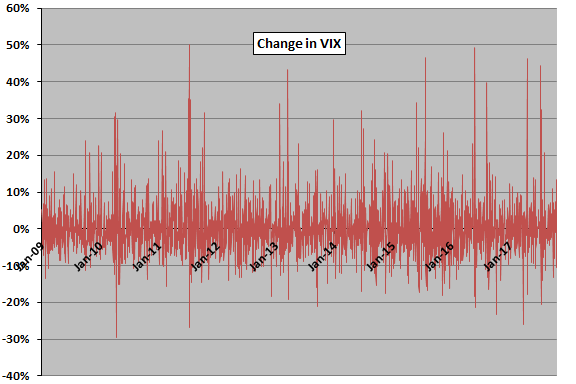 The next chart tracks daily change in VIX since the end of January 2009. We use this very noisy sample to investigate its power to predict daily VXX and XIV returns. 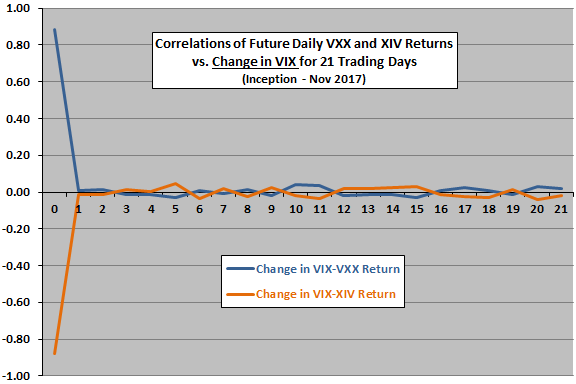 The next chart relates future daily VXX and XIV returns for each of the next 21 trading days to daily change in VIX over available sample periods. Day 0 is the measurement date for change in VIX. Results do not support belief that daily VIX change has a consistent/useful relationship with VXX or XIV daily returns over the next month. Findings in “Exploit Short-term VIX Reversion with VXX?” generally agree. In case there is an important non-linear effect, we look at average next-day XIV returns by decile of daily changes in VIX. 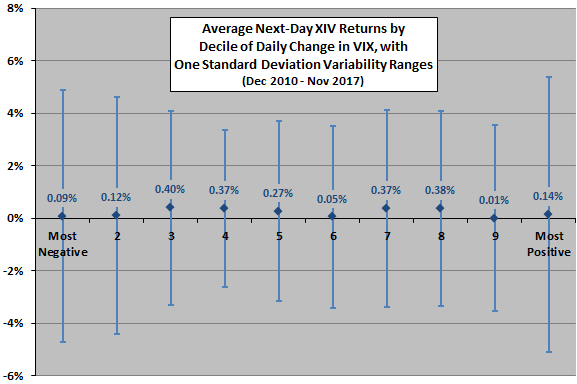 The next chart summarizes average next-day XIV returns by decile of daily change in VIX over the available sample period, with one standard deviation variability ranges. There is no progression of average returns across deciles, nor much temptation to develop a strategy that excludes returns for small or large changes in VIX. What about level of VVIX? 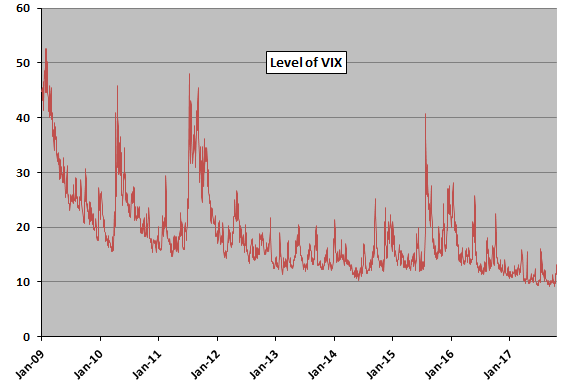 The next chart tracks daily level of VVIX since the end of January 2009. We use this sample to investigate its power to predict daily VXX and XIV returns. Exhibits a persistent small negative correlation with VXX returns over the next week. In other words, a relatively high (low) VVIX tends to be slightly bad (good) for future VXX returns. Exhibits a persistent small positive correlation with XIV returns over the next week. In other words, a relatively high (low) VVIX tends to be slightly good (bad) for future XIV returns. In case there is an important non-linear effect, we look at average next-day XIV returns by decile of daily levels of VVIX. 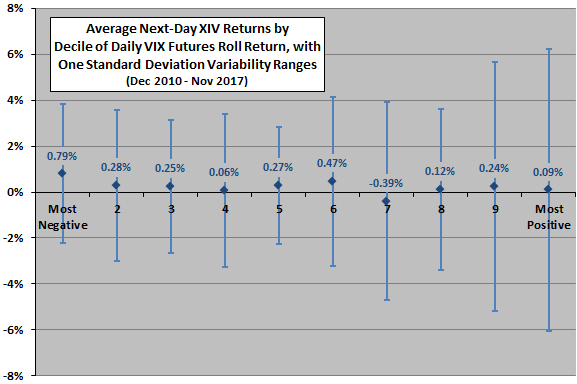 The next chart summarizes average next-day XIV returns by decile of daily level of VVIX over the available sample period, with one standard deviation variability ranges. There is no progression of average returns across deciles. There is some temptation to develop a strategy that excludes returns for low levels of VVIX, but returns for high levels of VVIX are extremely volatile. What about VIX futures roll return? The next chart tracks daily VIX futures roll return since the end of January 2009. It is mostly negative. We use this sample to investigate its power to predict daily VXX and XIV returns. 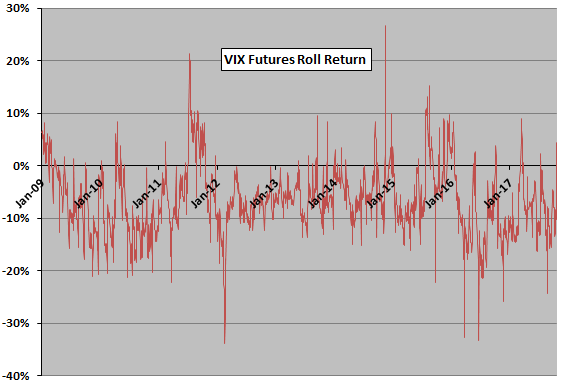 Exhibits a persistent small positive correlation with VXX returns over the next two weeks. In other words, a relatively high (low) roll return tends to be slightly good (bad) for future VXX returns. Exhibits a persistent small negative correlation with XIV returns over the next two weeks. In other words, a relatively high (low) roll return tends to be slightly bad (good) for future XIV returns. In case there is an important non-linear effect, we look at average next-day XIV returns by decile of daily VIX futures roll return. The next chart summarizes average next-day XIV returns by decile of daily VIX futures roll return over the available sample period, with one standard deviation variability ranges. There is perhaps some progression of average returns downward across deciles. There is some temptation to develop a strategy that excludes returns for high (most positive) VIX futures roll returns, which have relatively low average returns and high volatilities. The next chart tracks daily VRP since the end of January 2009. It is mostly positive. We use this sample to investigate its power to predict daily VXX and XIV returns. 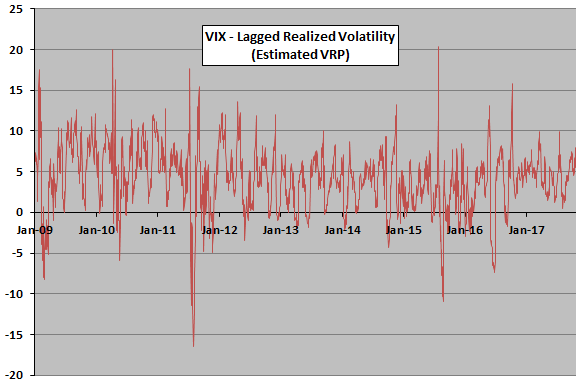 Exhibits a persistent small negative correlation with VXX returns over the next week. In other words, a relatively high (low) VRP tends to be slightly bad (good) for future VXX returns. Exhibits a persistent small positive correlation with XIV returns over the next week. In other words, a relatively high (low) VRP tends to be slightly good (bad) for future XIV returns. In case there is an important non-linear effect, we look at average next-day XIV returns by decile of daily VRP. 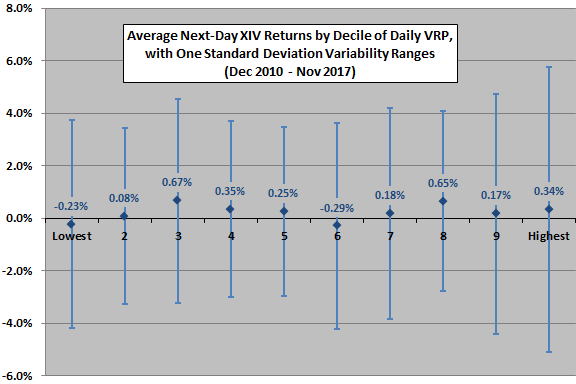 The final chart summarizes average next-day XIV returns by decile of daily VRP over the available sample period, with one standard deviation variability ranges. There is no progression of average returns across deciles. There is some temptation to develop a strategy that excludes returns for the lowest (most negative) values of VRP. 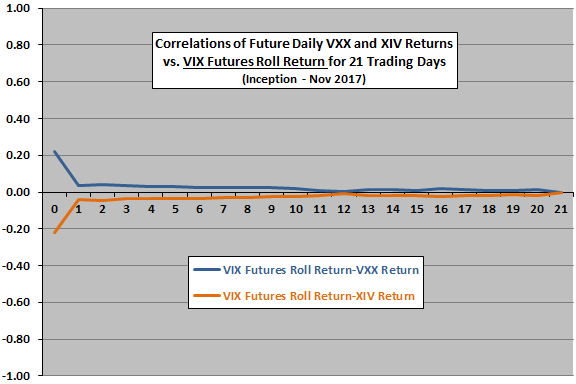 In summary, evidence from simple tests on available data suggests that VXX and XIV trading strategies that exclude the highest (most positive) VIX futures roll returns and the lowest (most negative) VRPs may be attractive. Sample periods for VXX and (more so) XIV are short, especially with respect to number of VIX regimes. The available samples may not be representative of long-term behaviors. All the above tests are in-sample. The available sample periods are very short for out-of-sample testing. Translating findings into trading strategies involves frictions/shorting costs that work against profitability. Testing many indicators on the same data introduces snooping bias, such that results for the best-performing indicators overstate expectations. Some term structure metric other than nearest to next nearest VIX futures price change (such as overall term structure slope) may work differently. Some other metric for VRP may work better (such as a higher-frequency measurement). Trading in the easily accessible VXX and XIV may have grown so intense that these ETNs are growing the demand for VIX futures, thereby potentially changing the behaviors of indicators. These ETNs are financial instruments constructed from derivatives of a measurement of U.S. stock market expected volatility (not a real asset), dependent on the financial health of the offerors. See also “Diversification with VIX Futures and Related ETNs” and “Short-term VIX Futures Performance”.